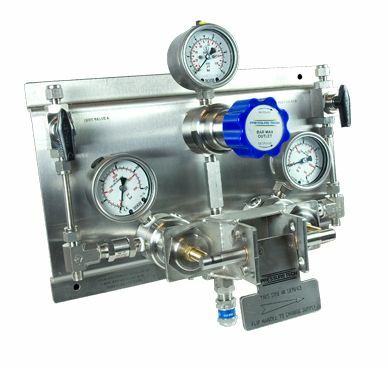 The ACS310 auto-changeover system provides a continual supply of gas, ideal for applications such as in medical or laboratory processes where a continual supply of gas is essential. Upon depletion of one bank, the other automatically cuts in. A quick switch of the lever ensures the supply is reset to its original value. An optional second stage regulator prevents fluctuations in supply pressure. In addition to the features of the previous ACS300, the ACS310 offers a solid disk type main valve assembly.